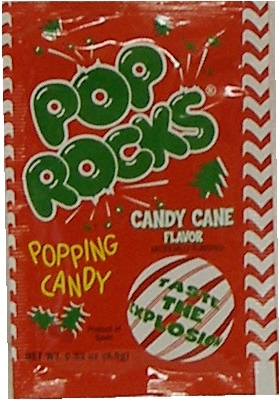 Pop Rocks was one of my favorite candies as a kid. It’s one that wasn’t available at every store you went to, so it was kind of special when you got it. The popping candy was simply awesome. Now, Pop Rocks has come out with special Holiday-themed Candy Cane flavor Pop Rocks and when I saw them at my local candy store, I had to get some. The Rocks themselves are mostly red (cherry?) with some scattered white ones thrown in. I’m pretty sure the red ones are cherry flavored and the white ones are peppermint. I didn’t really like the taste of the mix of cherry and peppermint – it just doesn’t work for me. It didn’t taste like a candy cane, and cherry-mint just isn’t a very good flavor combo. It’s a good holiday gift and would make a great stocking stuffer for the kids, but I won’t be upset when the holidays are gone and Candy Cane Pop Rocks leave too. Give me some classic Cherry Pop Rocks any day. I bought some of these but haven’t tried them yet. I really don’t like cherry though, so perhaps my roommate will get them in her stocking instead.